Administrative accounts in your Portal for ArcGIS organization. The account that you use to set up access to Portal for ArcGIS in the Post Installer. The account that you use to set up access to ArcGIS Online in the Post Installer. Administrative accounts in your ArcGIS Online organization. Accounts that belong to the Windows group that you configure in the Post Installer. If you try to sign in to Manager using any other type of account, you are denied access. Change which ArcGIS accounts have access to Manager. Includes instructions for both Portal for ArcGIS and ArcGIS Online. Change which Windows accounts have access to Manager. You can change which accounts have access to Manager. 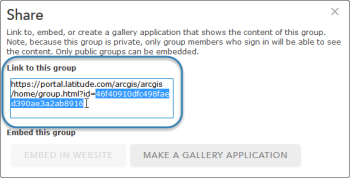 Use this method if you configured Manager sign-in using Portal for ArcGIS or ArcGIS Online. Security-related settings and data are stored in the XML-based Security Store, which is a component of Geocortex Core. The Security Store has a ClaimsToAccept element that you can edit to change the accounts that have access to Manager. Each Claim element within ClaimsToAccept defines one or more accounts that have access to Manager. If you configured Manager sign-in using Portal for ArcGIS, these claims apply to Portal for ArcGIS accounts. If you configured Manager sign-in using ArcGIS Online, the claims apply to ArcGIS Online accounts. Allow an individual to sign in to Manager. Allow a group to sign in to Manager. Allow your entire organization to sign in to Manager. Prevent organization administrators from signing in to Manager. Allow someone from outside your organization to sign in to Manager. Follow the instructions to allow a group to sign in to Manager. Right-click the Geocortex Essentials title bar icon and select Edit Security Store. This element controls access to Essentials. Find the ClaimsToAccept element within the PolicyDetails element. In the Value attribute of the new Claim element, replace [account] with the ArcGIS user name of the user that you want to add, for example, Value="amarch". To find out the user name, go to the My Organization page in your portal. Note that, if you are using ArcGIS Online sign-in to Manager and Enterprise Logins are configured for your ArcGIS Online organization, the user name is appended with an underscore followed by an identifier for your organization, for example, amarch_Latitudegeo. Find the IssuersToAccept element within the same PolicyDetails element as ClaimsToAccept. Find the Issuer value that starts with urn:gcx:ags, for example, Issuer="urn:gcx:ags:50136408-91F3-45B7-8B8E-5BBBFA89F44E". In the Issuer attribute of the new Claim element, replace [issuer] with the Issuer value that you located in the previous step. You do not need to remove any Claim elements from the XML. This makes the changes to the XML take effect. In the Connections panel, click Application Pools. In the Application Pools panel, right-click EssentialsAdministrationAppPool4 and click Recycle. You can use this method to allow someone from outside your organization to sign in to Manager. Sign in to Portal for ArcGIS or ArcGIS Online using the same account that you used to sign in to Portal for ArcGIS or ArcGIS Online in the Post Installer. Create a group for Geocortex Essentials administrators. We recommend that you make the group private. Invite the users that you want to be able to sign in to Manager to join the new group. You can invite members of your organization, as well as ArcGIS users who do not belong to your organization. In the side panel's Folders area, click Geocortex Products. 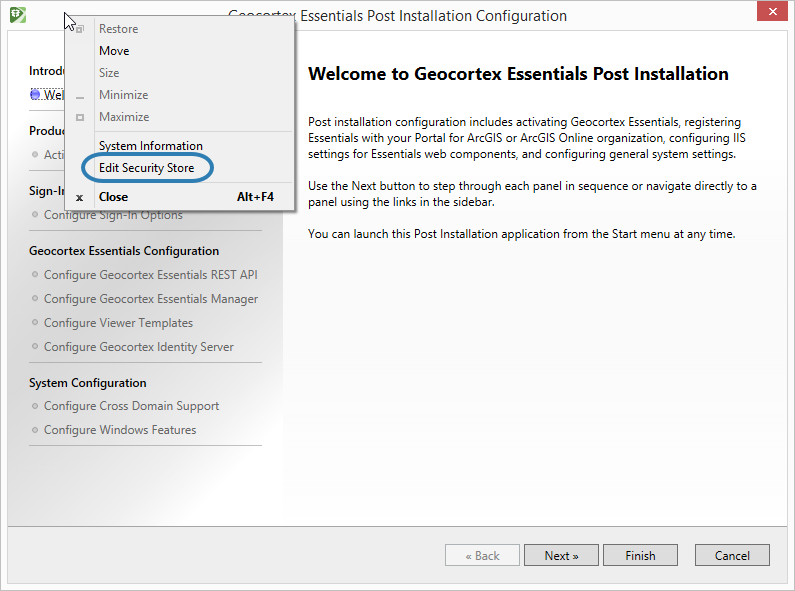 The Geocortex Products folder contains two web mapping applications that were created by the Post Installer—Geocortex Essentials and Geocortex Essentials Manager. Click Geocortex Essentials Manager to view its details. Select the checkbox for the group that you want to be able to sign in to Manager. Click Details to view the group's details. In the Link to this group box, copy the value of the id parameter. You will use this value in Step 2. In the Link to this group box, copy the URL. Point your web browser to a site that expands short URLs, such as http://longurl.org or http://knowurl.com. Paste the URL into the input box. Click the button to expand the URL. In the expanded URL, copy the value of the id parameter. In the Value attribute of the new Claim element, replace [group] with the ID that you located in Step 1, for example, Value="c71a947bb05d4c3d890d24933455791e". Giving your entire organization access to Manager is not recommended. We recommend that you limit access to particular individuals or to a group that is created for this purpose. This makes the change to the XML take effect. If you do not want organization administrators to be able to sign in to Manager, remove the this_org:org_admin claim from the Security Store. Restarting the RestManager web application causes the changes to the Security Store's XML to take effect. You can change which accounts have access to Manager. If you configured Manager sign-in using Windows, you can change which accounts have access to Manager by selecting a different Windows group in the Post Installer. On the server that hosts Manager, use the Windows management tools to create a local group. Alternatively, you can use a domain group. Add the users that you want to be able to sign in to Manager to the group. Launch the Post Installer and click Configure Sign-In Options in the side panel. In the Group box, type the name of the group that users must belong to in order to sign in to Manager. Click Finish and close the Post Installer.